We are pleased to announce that that UFCW Local 23 and Local 1776 members have voted overwhelmingly to merge, creating Local 1776 Keystone State. We would like to thank the hundreds of Local 23 and Local 1776 members who came out to vote for this merger, and we are happy to announce that this was voted on with nearly 100% approval. 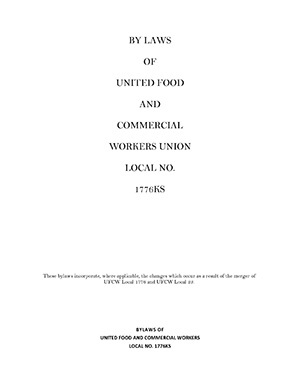 UFCW Local 1776 Keystone State will represent over 33,000 members across the state of Pennsylvania, and will be the United Food and Commercial Workers statewide Local. Local 1776 Keystone State will now have jurisdiction over the entire state of Pennsylvania, as well as parts of New York, Ohio, and West Virginia. We will represent dozens of industries across the Commonwealth, with hundreds of employers including Acme, the PA Wine & Spirits Stores, Giant Eagle, Kroger, Cargill, The Hershey Company, and more. This is a fantastic result for the members of Local 23 and Local 1776. With strength in numbers, we will now have a louder voice at the bargaining table and in the workplace. Our statewide footprint will put us in a better bargaining position and we will be able to ramp up our organizing campaigns across the state, representing new members who deserve better wages, better benefits, and voices in their workplaces. With a stronger united front, we are in our best position yet to negotiate tough contracts and provide better wages and benefits for our hardworking members. We will have more funds to pay for the services we provide members, improved resources to weather a strike or other action, and increased power when negotiating contracts and organizing workers. Local 23 and Local 1776 have a long history of working together on many issues over the years, and we are excited to open a new chapter in this partnership. 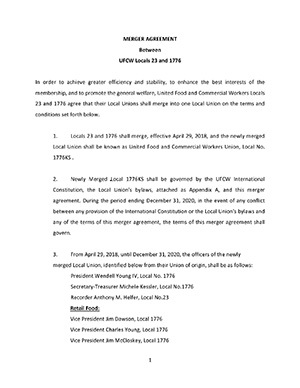 The effective date of the merger is May 1st, 2018, and we will be spending the months preceding working together to ensure a seamless transition to become UFCW Local 1776 Keystone State. Again, we would like to thank the members of Local 23 and Local 1776 for supporting this merger, and look forward to representing a united front of 33,000 members. How will this affect me? The merger is in the best interest for Local 23 because will grow from roughly 11,000 members to 33,000 members. We will have a stronger voice in contract negotiations and this is key because in 2018, half of our current members’ contracts will be up for negotiation. Will this affect my job or change my hours? No. The merger of two locals has no impact on members’ hours or jobs. Will this affect my contract? No. Looking ahead, however, we believe that our combined locals will be in a better position to negotiate strong contracts. There is strength in numbers. Will this increase my dues? No. The leadership teams at Local 23 and Local 1776 will continue to manage all expenses to ensure that members’ dues are invested wisely. Will this change my benefits or health care in any way? No. As we look ahead, however, we believe that will be able to negotiate for better healthcare for two reasons: First, we will have a combined 33,000 members and larger purchasing power. Second, we will have access to plans across the state, and that will put us in a better negotiating position. Will this change my status as a shop steward? No. All stewards will continue in their current roles. What area will our local now cover? We will cover the entire state of PA, and parts of northern WV and eastern OH, and we will be in many, many more industries and sectors, because 1776 is more diversified than we are. Will this change who my union representative is? No. All union representatives will continue in their current roles, and the Local 23 leadership team and staff will remain in place. Will the membership get to vote on this decision? Yes. This is a democratic process and every member has the right to vote. A majority of voting members from both locals must approve the merger. Will the UFCW offices change locations? No. There are no plans to relocate any offices, and we are committed to provide all of the services that members currently receive quickly and conveniently.